In sports, as athletes engage in proper training or wear protective gears, injuries are inevitable. It has been reported that aside from domestic accidents, it is one of the common cause of injuries seen at the emergency room. Although most injuries reported are those of the lower extremities, injuries of the upper extremities occur as frequent as well. The upper extremities include the hands, the wrists, forearms, elbows, upper arms, shoulder, clavicle and scapula. Injuries of the upper extremities at work are also common. This may include a fall while on the job, such as a federal worker, or slipping on something in the office. Upper extremity injuries are encountered mostly from falling or with sports, from catching or getting hit by a ball. Also there is a high likelihood of sustaining a ligament injury or fractures. In basketball and skating, women are more prone to have upper extremity injuries because of falls while men involved in more risky sports such as snowboarding or skiing, are the ones predominantly to have injuries of this type. sports that are more prone to upper extremity injuries. Depending on a person’s age, a fall at work may result in an AC separation. If there is direct contact on the shoulder the ligaments between the clavicle and the acromion can be damaged, leading to pain for months. 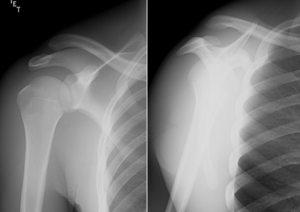 Or the clavicle itself can be broken, also known as the collarbone. Most of these injuries can be treated nonoperatively, but not all. Additional injuries that can occur from falls include fractures of the humerus, rotator cuff tears, or a wrist fracture or sprain. If you are a Border Patrol agent for instance, pursuing a suspect may lead to a fall with a resulting ligament sprain, tendon tear or fracture. Same goes for a police officer or even a postal worker slipping on pavement during a delivery. With regards to the type of injury, those sustained in the upper extremities are also common in comparison to lower limb injuries especially in fractures. In case of contact or collision injuries, the forearm is the predominant part in contact and falling on an outstretched arm results to severe trauma. This is because the forearm acts as a shock absorber as it bears the weight of the body falling down. As an individual ages, it takes longer for these injuries to heal. A baby heals a fracture within 2 weeks. Skeletally mature adults in their 30’s to 50’s may take 2 months or longer to fully heal ligament sprains/tears or fractures. If you have been injured at work, let AIMA help you. The practice has a Board Certified Phoenix work comp doctor, who is highly skilled at reducing pain, increasing function, and getting people back to work. This includes federal injured workers. In fact, AIMA recently achieved the distinction of treating a federal injured worker from its 12th state! Individuals travel from all over to be treated by Dr. Adarmes for two reasons.